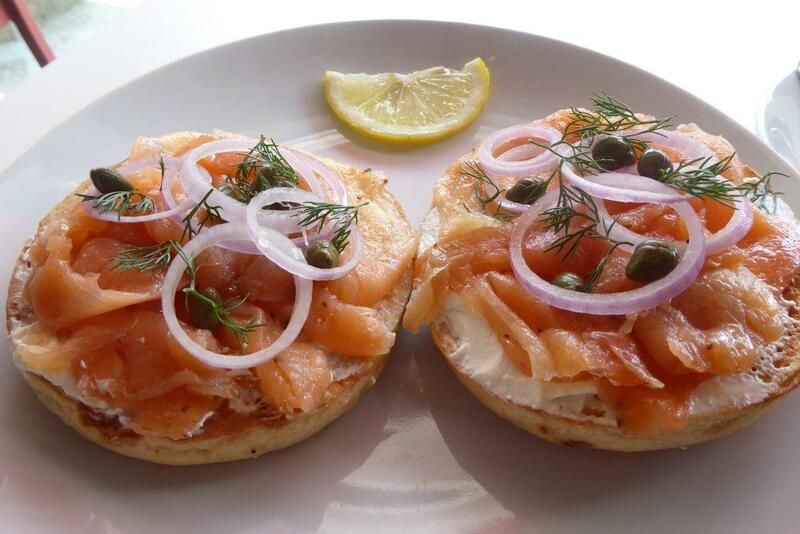 BKK Bagels serves up authentic New York style bagels as well as American style breakfasts, salads, sandwiches, and desserts. The bagels are hand rolled, kettle boiled then baked. There is a choice of 9 types of bagel, whole wheat, plain, sesame, cinnamon raisin, poppy seed, rye, onion, sea salt, and everything as well as three kinds of cream cheese. 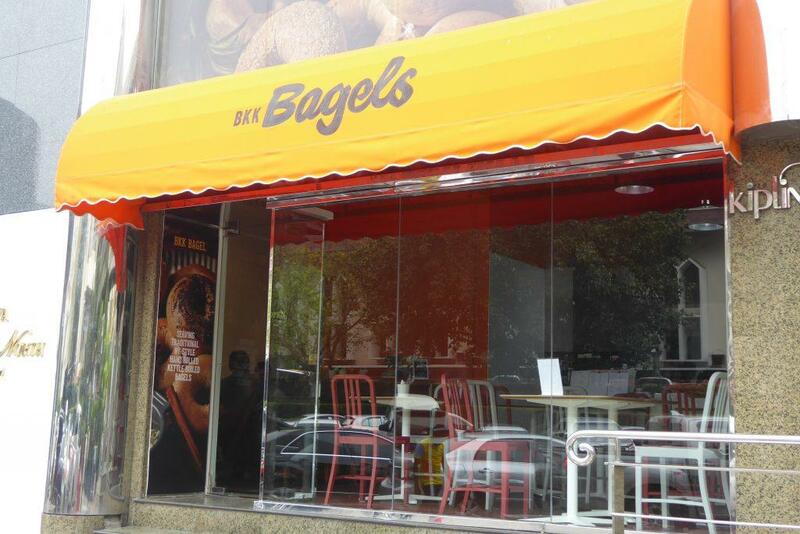 The bagels are also available for takeaway. 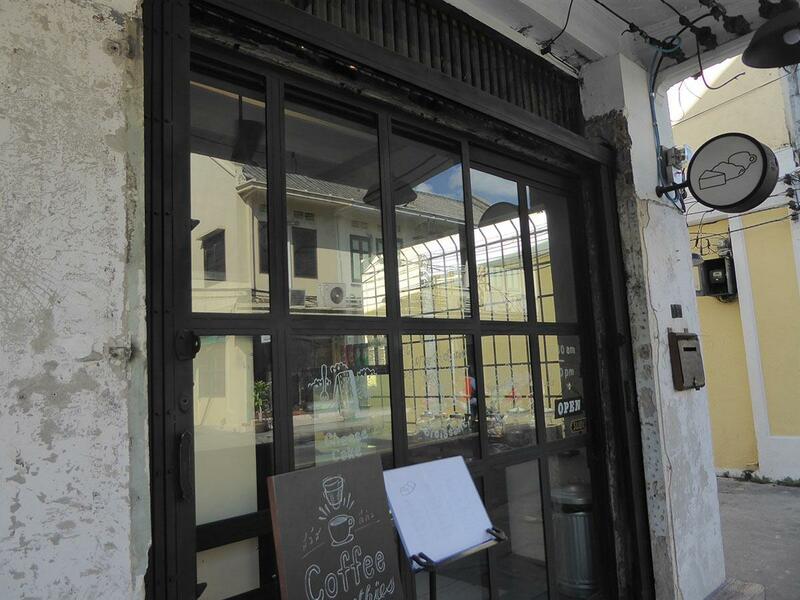 Beverages include good coffee and a variety of fresh juices. Specialties of the house include Pastrami and Rueben sandwiches, smoked salmon and lox bagels, corn beef hash and pecan pie. Daily specials are listed on the chalkboard menu. 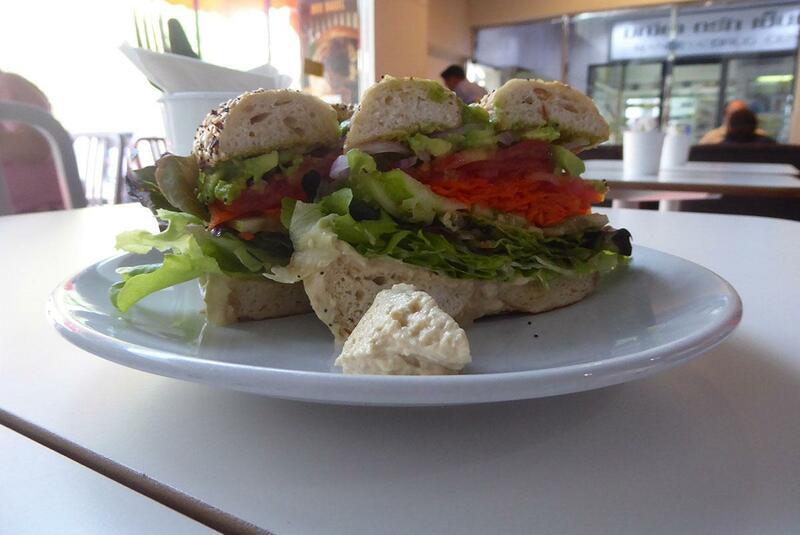 The bagels and fillings are freshly made daily so you may find some options are unavailable later in the day. Vegetarians are catered for with several options on the menu. Location: 518/3 Maneeya Center, Ground Floor, Ploenchit Road, Bangkok. Opening Hours: 07.30-17.00 Monday-Friday. 07.30-17.30 Saturday-Sunday. Getting There: BTS Chit Lom (exit 2). 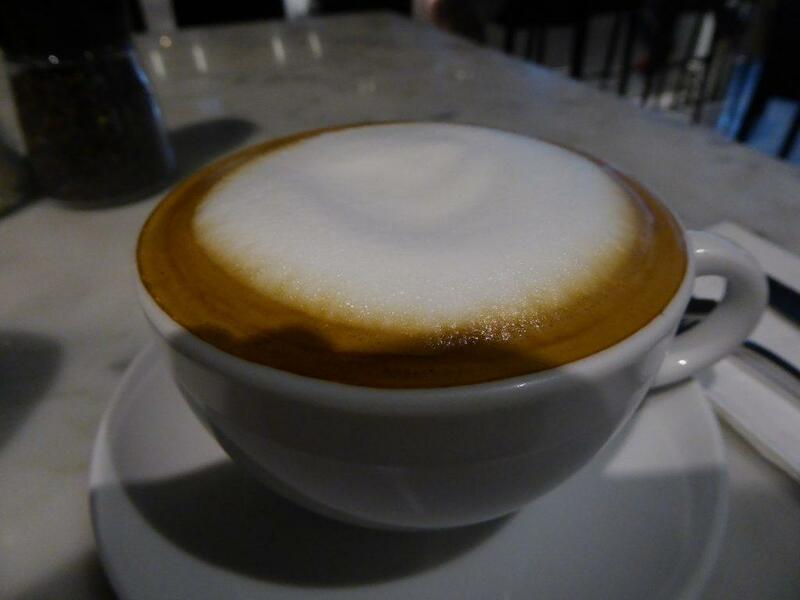 Dean & Deluca is a famous New York deli chain and arguably serves the best cappuccino in Bangkok. The flagship market branch at the Mahanakhon Cube building which is next to the Mahanakhon Tower (the tallest building in Bangkok) includes an upmarket grocery store featuring speciality and prepared foods and home and kitchen accessories, a deli, and a café/restaurant serving a variety of hot and cold dishes including New York style pizza by the slice. 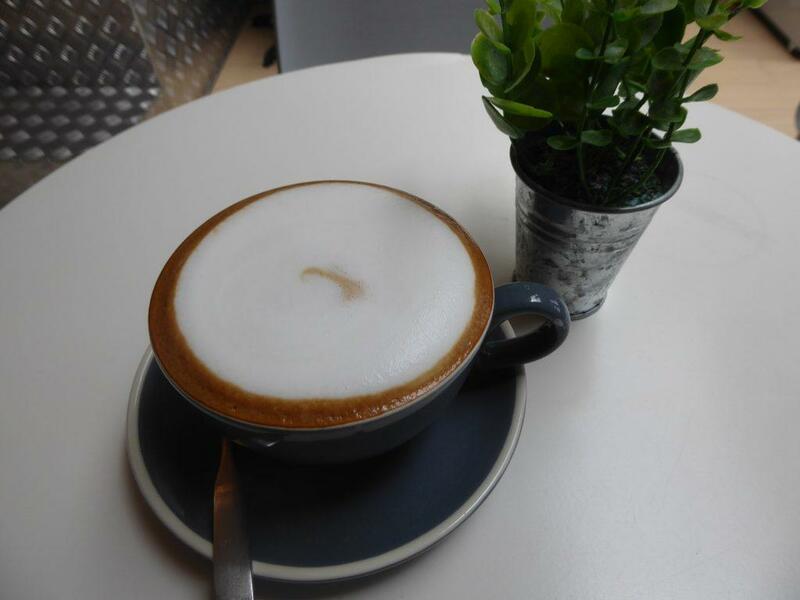 There are also café branches around town at Central Embassy Mall, EmQuartier Mall, Silom Soi 1, All Seasons Place, FYI Center, and Park Ventures as well as a branch at Suvarnabhumi Airport. The mall branches are open from 10.00-22.00 daily while the non-mall branches open earlier. Getting There: BTS Chong Nonsi (exit 3). Doi Chaang Coffee is authentic Thai coffee grown and harvested in the north of Thailand around a rural village of the same name. The coffee is organic and fair trade. 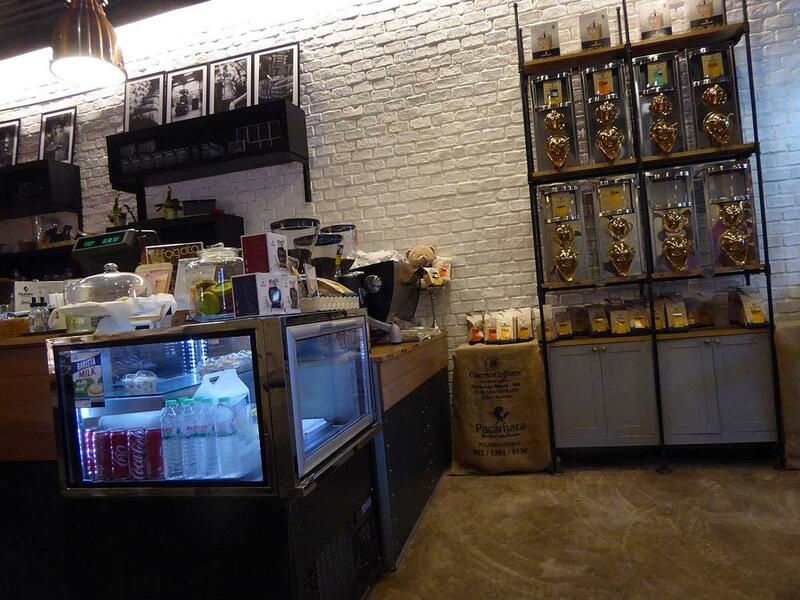 The specialties are Peaberry and the premium Wild Civet Coffee. The Civet Coffee is made from coffee cherries that have passed through the digestive system of a Civet Cat (a cat sizes mammal) though is not digested. It is also known as “cat poop” coffee! There is a full range of hot and cold coffees and teas as well as smoothies and juices. 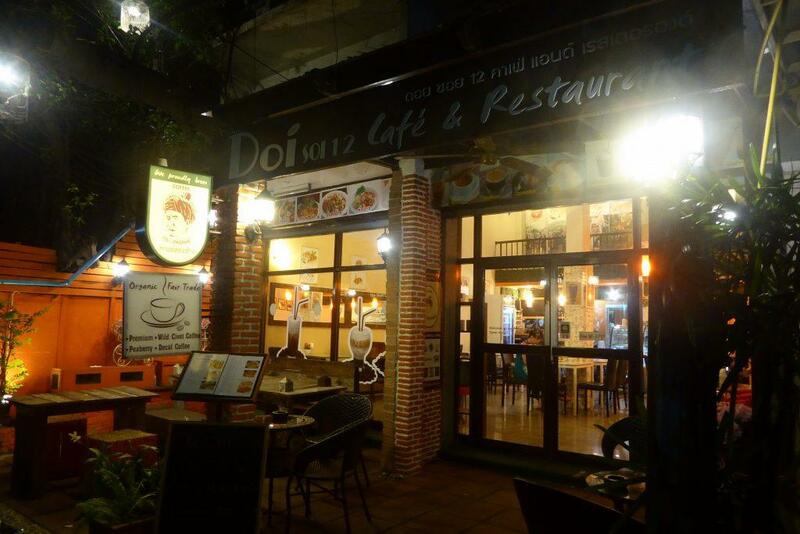 Doi also serves a full menu of very good northern and north-eastern Thai food at reasonable prices. There is a nice outdoor terrace. 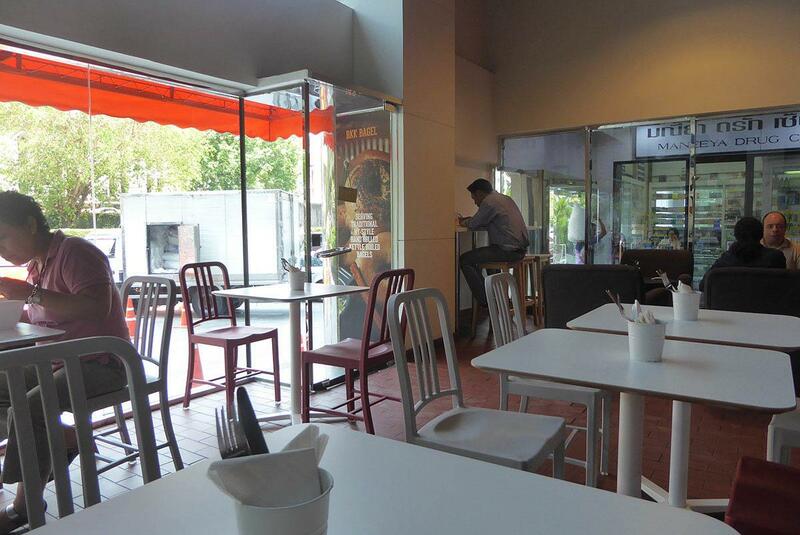 Quiet location just off busy Sukhumvit road on Soi 12. 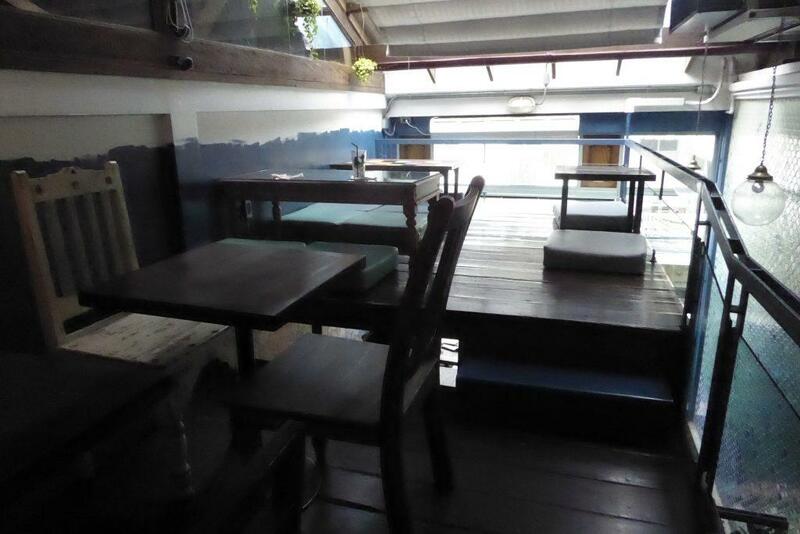 Location: 5/1-3 Sukhumvit Soi 12, Bangkok. Getting There: BTS Asoke (exit 2), MRT Sukhumvit (exit 3). 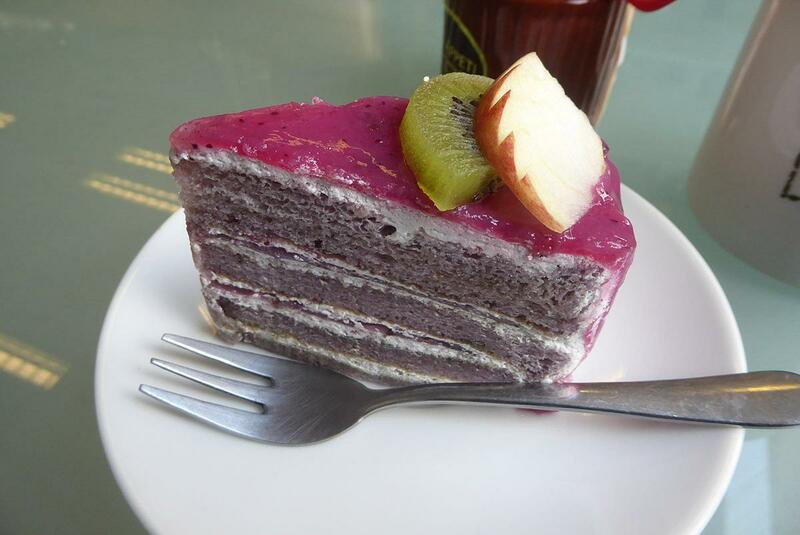 Konnichipan is the best bakery in the Khao San road area and one of the best in Bangkok. 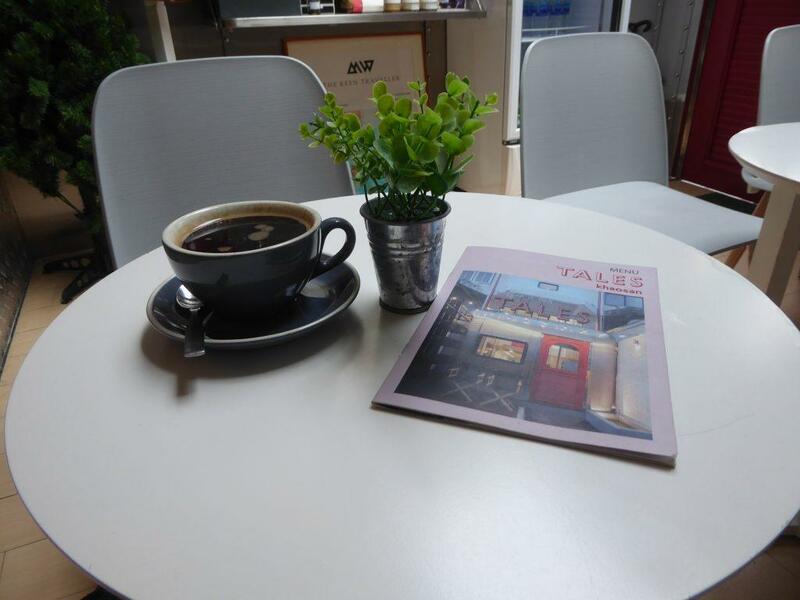 It’s a great place for breakfast, lunch, a snack or a takeaway. 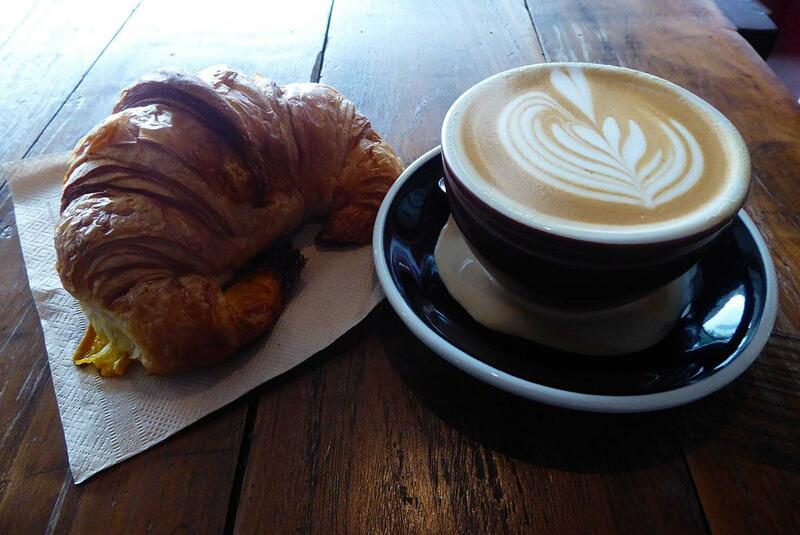 There is a large range of bakery from delicious authentic French style croissants, muffins, and tarts through to a range of bread including whole wheat, multi-grain, rye, and sourdough. There is also a range of freshly made sandwiches and good strong coffee. Location: 183 Chakrabongse Road, Banglamphu, Bangkok. Getting There: A one minute walk from the police station end of Khao San Road. 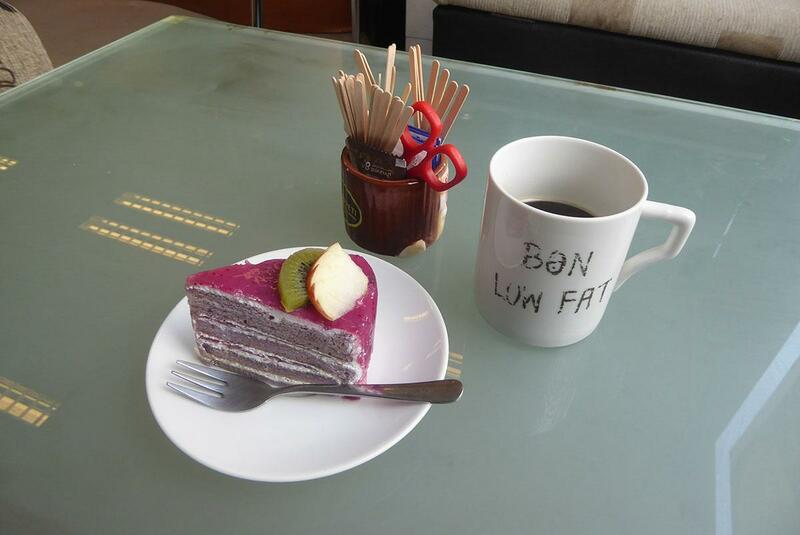 The Low Fat – Low-Calorie café is in the Ploenchit office building opposite the Marriot Hotel. 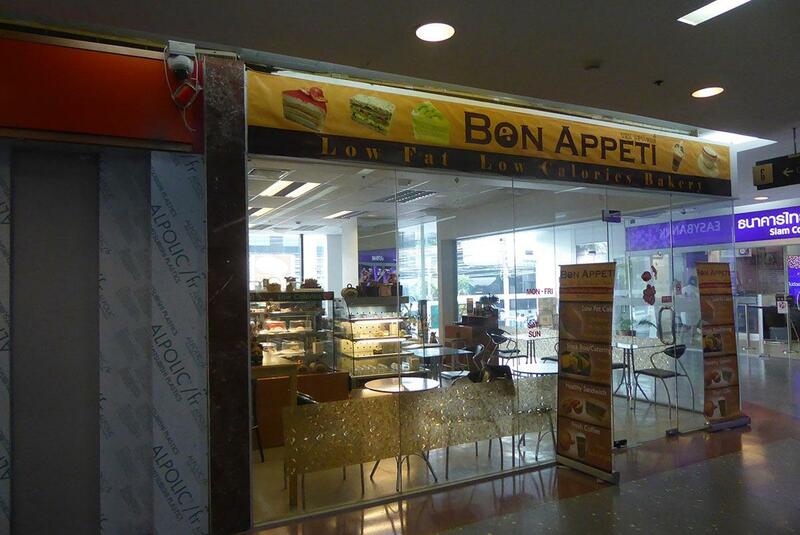 The café offers a health-conscious bakery, snack and dessert menu low in fat and calories. There is a range of cakes made without butter, egg yolk and with no added preservatives. There are also freshly made sandwiches. Take away snack/lunch boxes are available and can be made to order. Everything is helpfully labeled with the fat percentage and total calories. There is a good selection of hot and cold coffees and teas. Location: Ground Floor, Ploenchit Center, Sukhumvit Soi 2, Bangkok. Getting There: BTS Ploen Chit (exit 4). 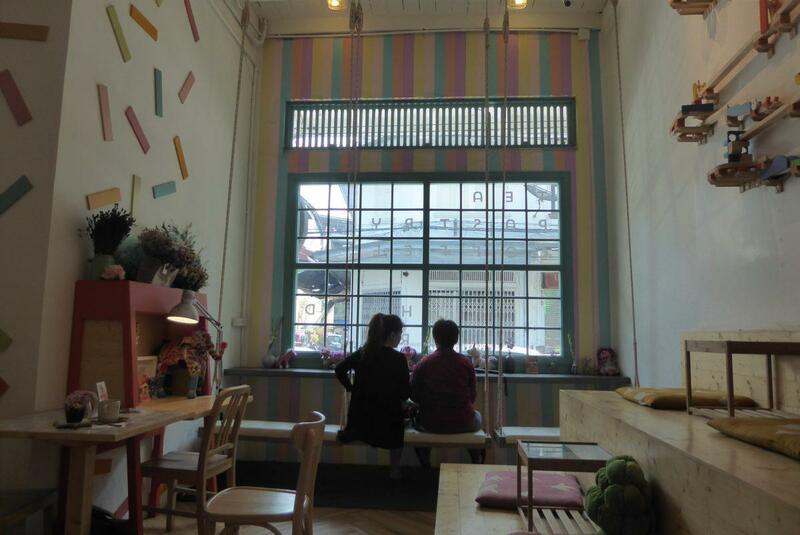 Nahim is a cute café in Chinatown with a quiet, cool atmosphere. 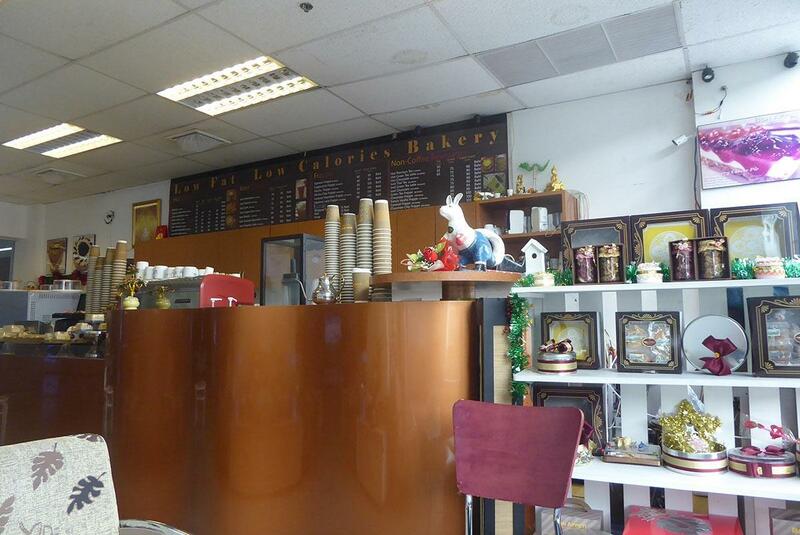 It serves hot and cold drinks as well as a selection of bakery, snacks, soups, hot dishes and desserts. 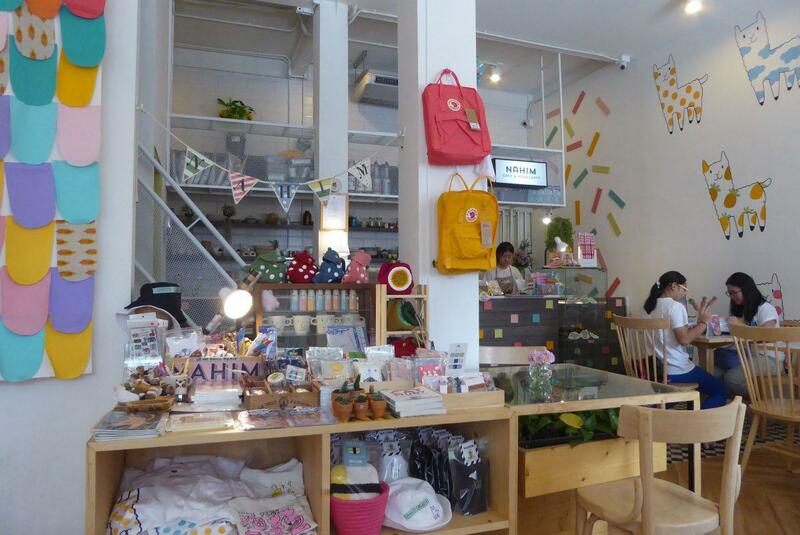 The café also sells a range of homemade handicraft items. 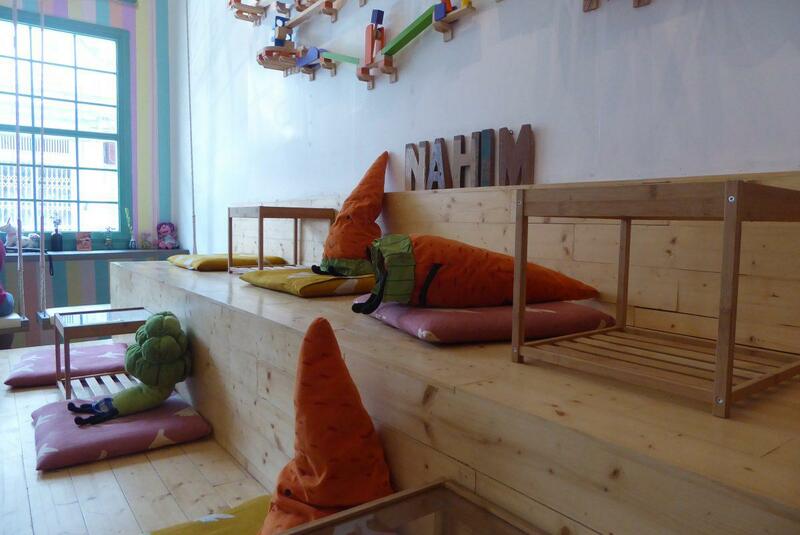 The interior is decorated creatively with wooden furniture, tables, benches, floor cushions, hanging swing chairs, IKEA carrot, and broccoli soft toy cushions and even a functional work desk. 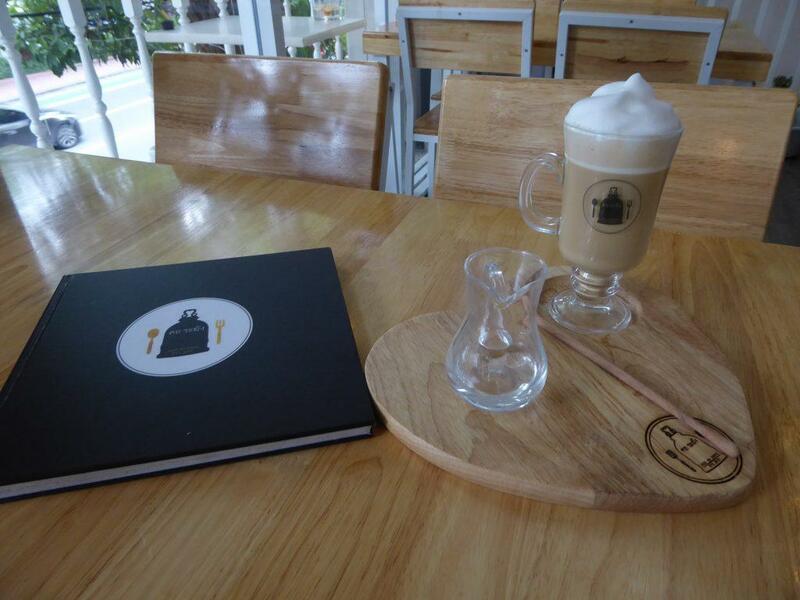 The creative menu has many signature creations with drinks served in cute smiley face cups, mugs and teapots starting at 50 baht and food from 60-200 baht. 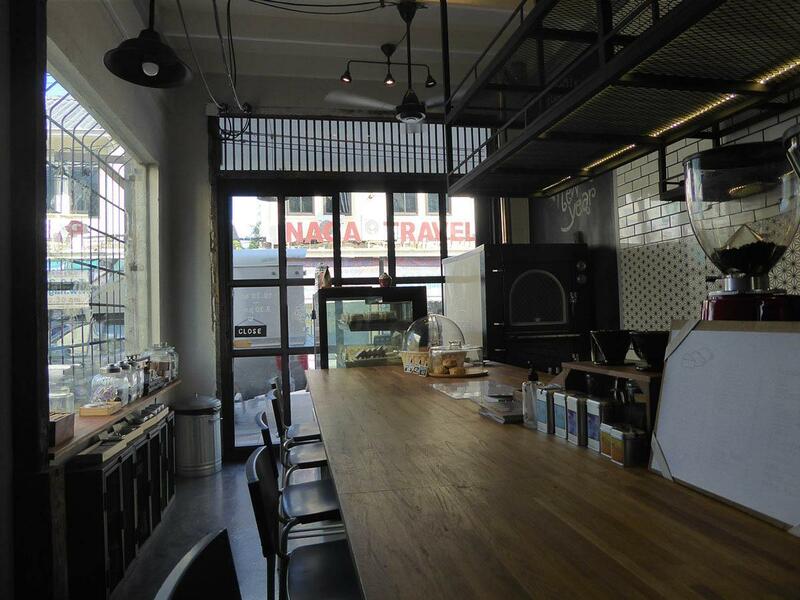 If you’re exploring Chinatown, Nahim is a great place to stop for a drink, snack or meal. 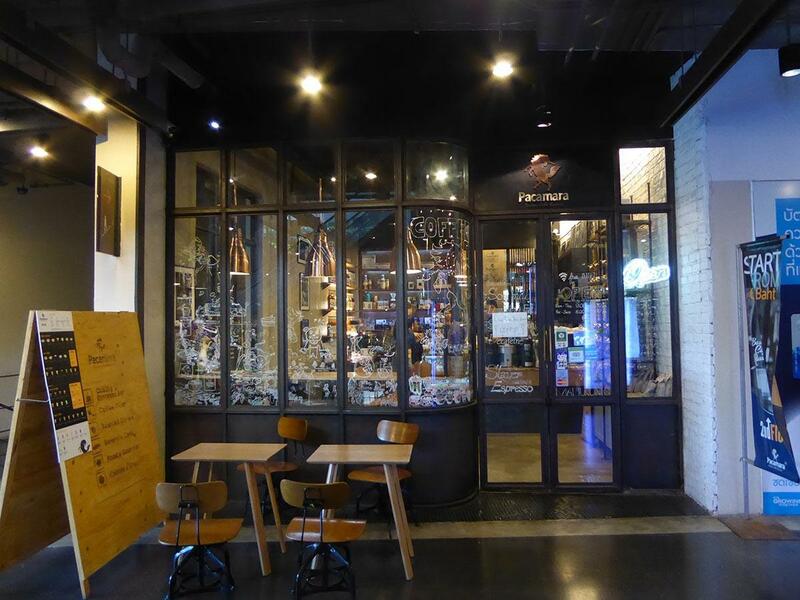 Location: 78 Charoenkrung Road, Soi 22 (Soi Nana), Chinatown, Bangkok. Getting There: MRT Hualamphong exit 3, then cross the canal and walk up Charoen Krung Road turning right into Soi Nana. Nahim is on the left. 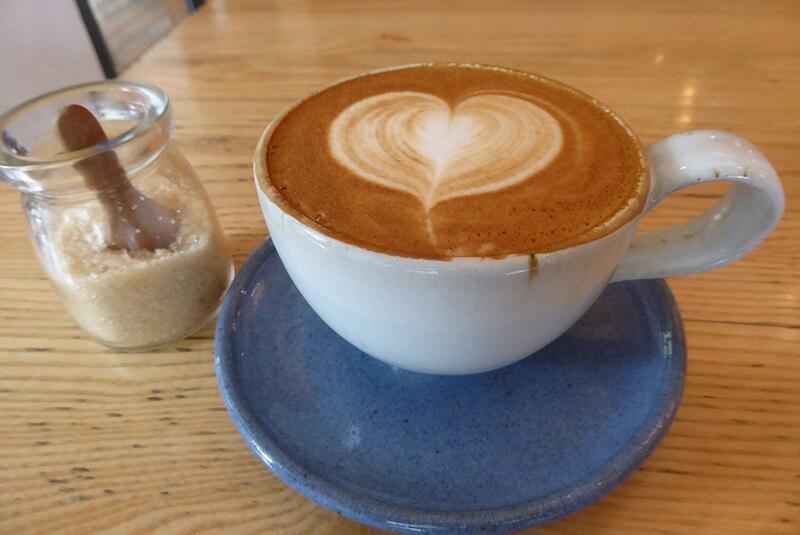 Pacamara is a small coffee bar located in the Rainhill community mall. Beans are imported from worldwide sources and roasted in-house. 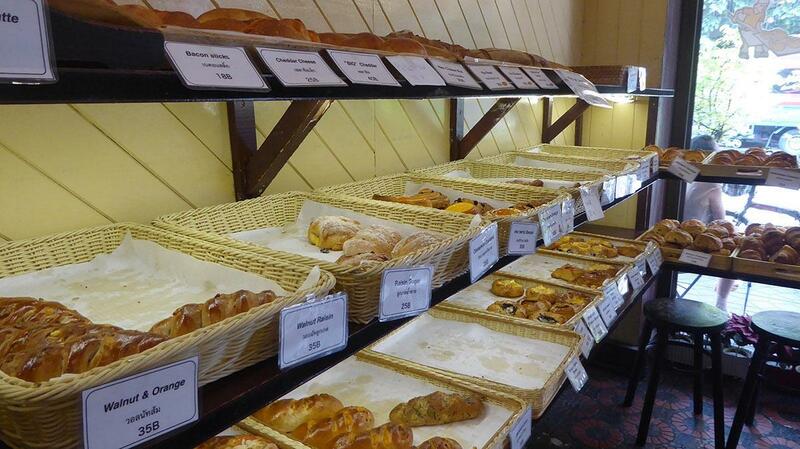 There is a small selection of bakery items including fresh croissants. Location: 2nd Floor Rainhill Mall, Sukhumvit Road Soi 47, Bangkok. Getting There: BTS Phrom Phong (exit 3). 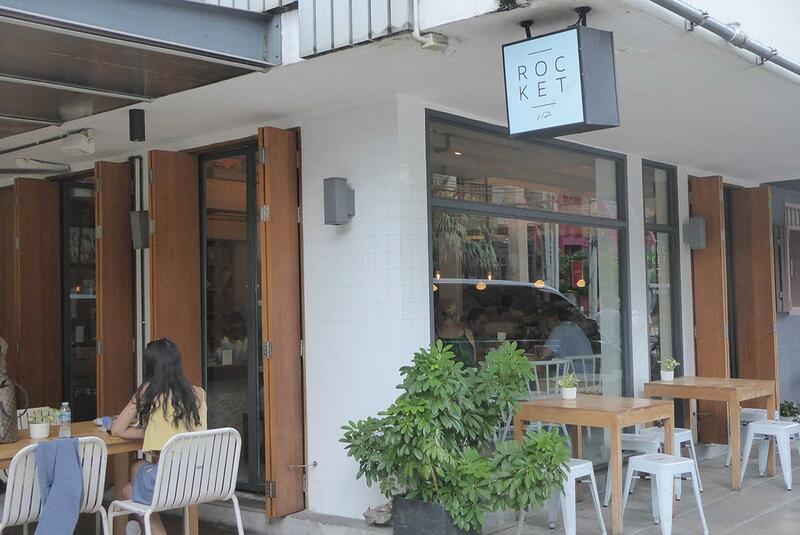 Rocket S12 is an upmarket coffee bar serving artisan coffees, coffee cocktails, and cold brew coffee. 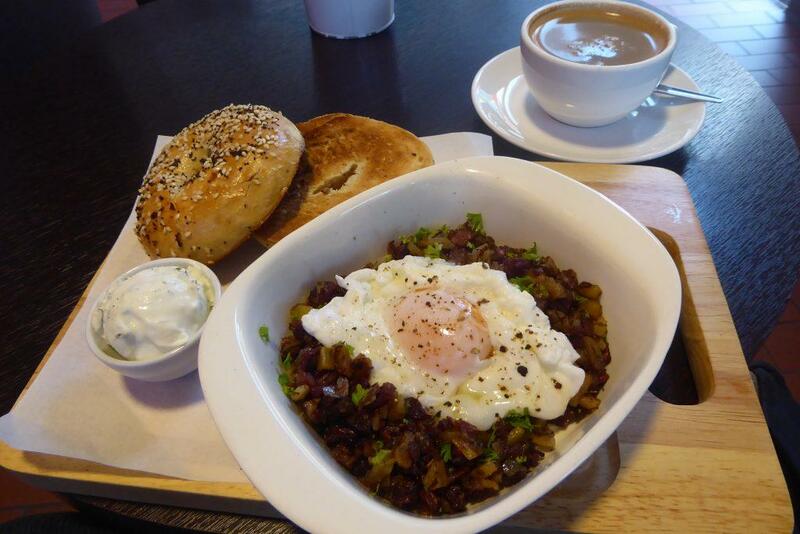 Food wise the menu includes Scandinavian style healthy breakfasts, mueslis, egg dishes, pasta, and open sandwiches. There are also waffles and fresh bakery products as well as a lunch/brunch menu. Location: 147 Sathorn Road, Soi 12, Bangkok. Getting There: BTS Chong Nonsi (exit 1), turn right into Sathorn Road. Turn right into Sathorn Soi 12. Rocket is on the right-hand side. 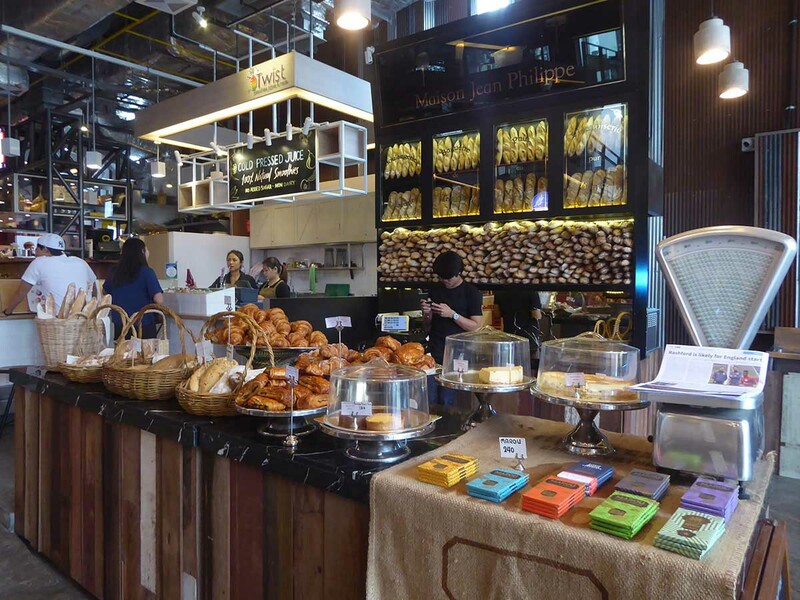 Roots are located in the Commons lifestyle mall in the Thonglor district. 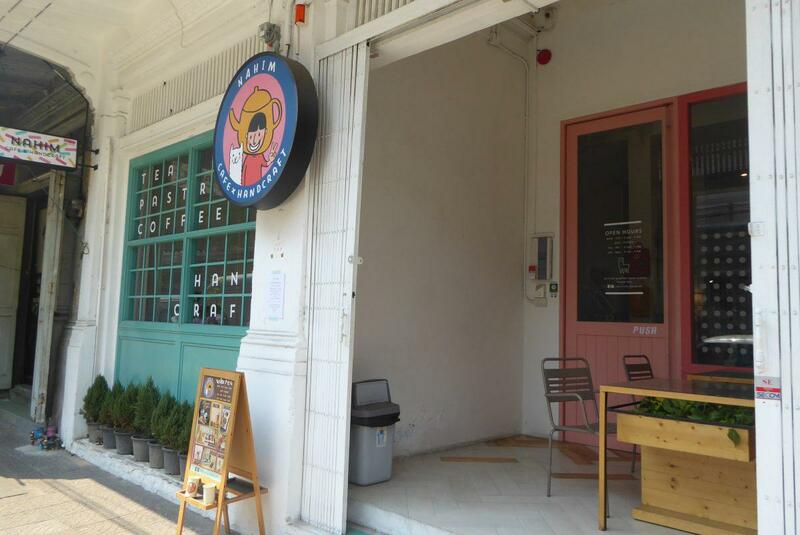 They roast their own coffee using imported and Thai beans. Roots also serve cold brew coffee. 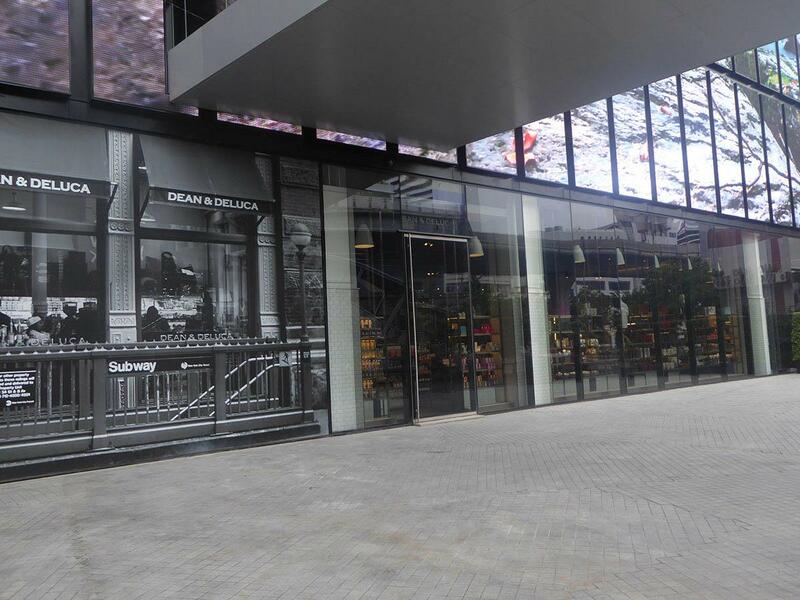 Next door is Maison Jean Philippe who bake artisan bread and a selection of authentic French-style croissants, pastries and more. Location: Ground Floor, The Commons, Thonglor Soi 17, Sukhumvit Soi 53, Bangkok. Getting There: BTS Thong Lo (exit 3). Turn left into Thonglor Road and take the red shuttle bus, taxi or walk. 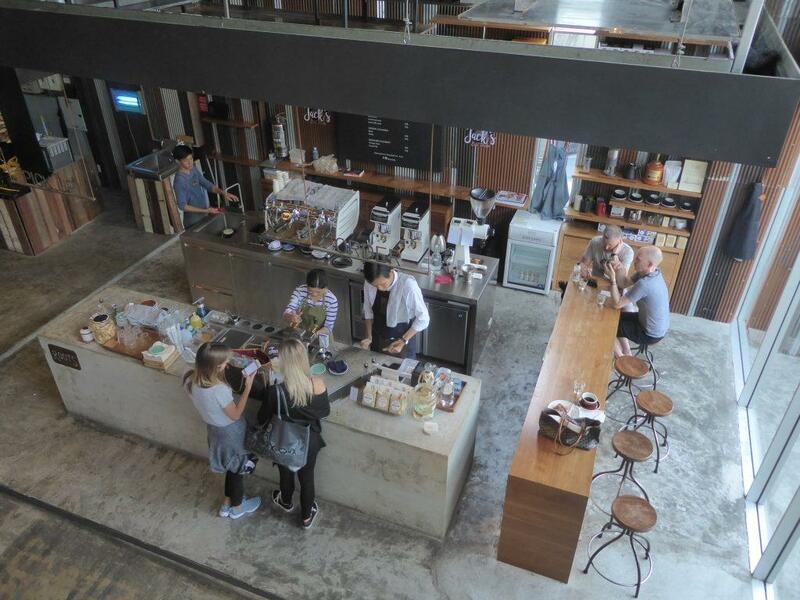 Unbranded is a small family run café a short walk from Khao San road just across the busy Ratchadamnoen Klang Road on Tanao road. Specialties include homemade fruit scones, fruit cake and a variety of cheesecakes. 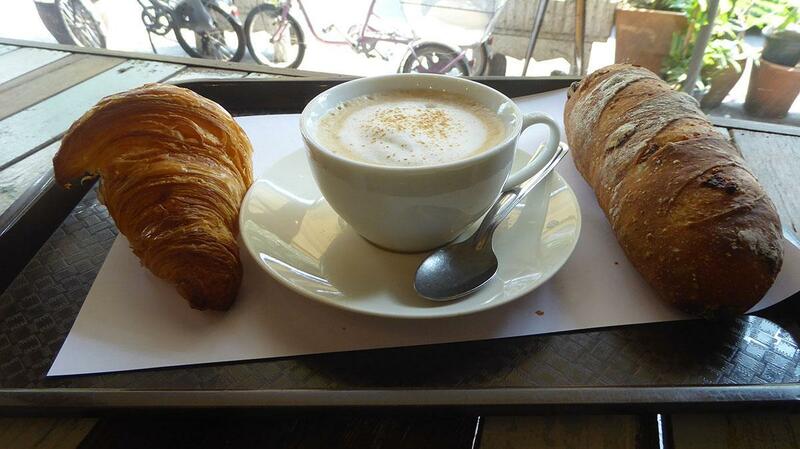 There are also croissants, cookies, and other bakery items along with good coffee, teas, and smoothies. 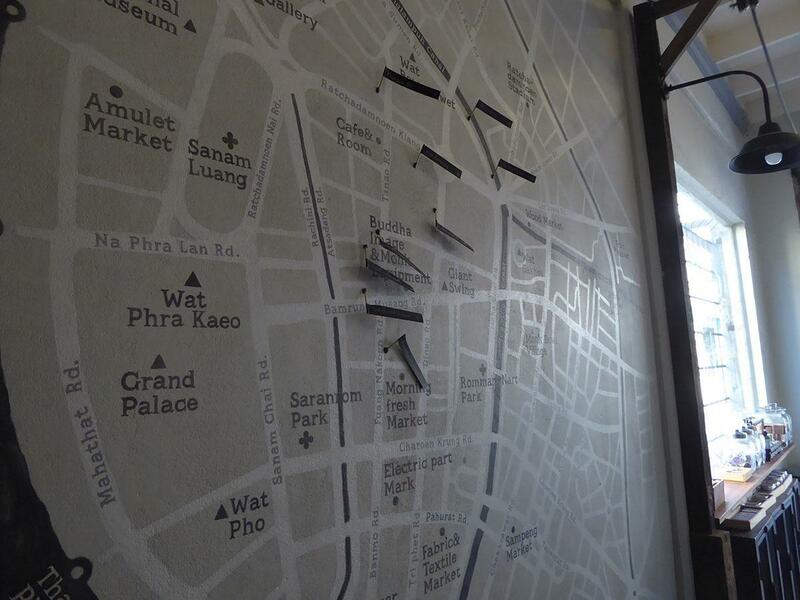 On the wall is a large painted map of the Rattanakosin area with the major sights highlighted which is handy if you’re exploring the area. Within a five-minute walk is Wat Suthat, the Giant Swing, City Hall and the Tiger Shrine. Location: 180 Tanao Road, Bangkok. Opening Hours: 09.30-19.00 Tuesday-Sunday. Closed on Monday. Getting There: Cross Ratchadamnoen Klang road at the Burger King end of Khao San road. Unbranded is a short walk up Tanao Road on the right-hand side. 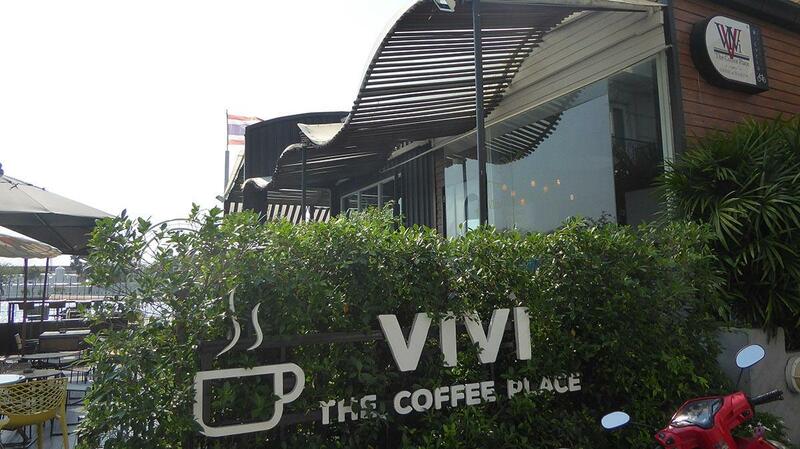 ViVi Coffee is located on Pansuk alley just off Maha Rat road next to the Chao Phraya River and a short walk from Wat Pho and Museum Siam. 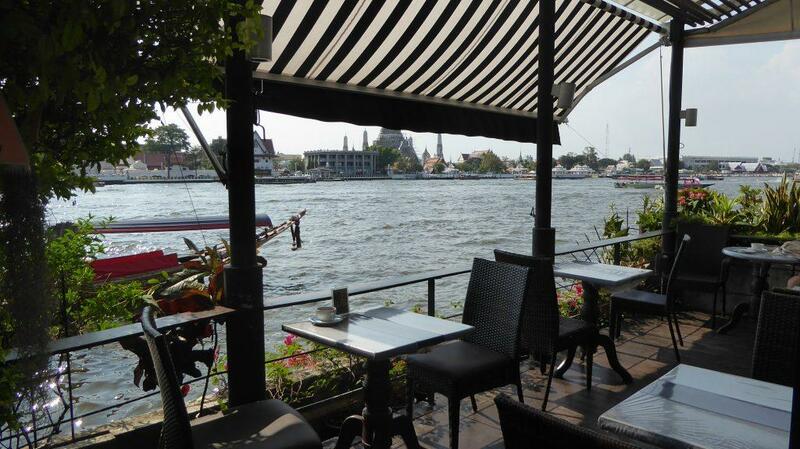 The cafe has a pleasant shady riverside terrace with a great view of Wat Arun as well as a small garden. 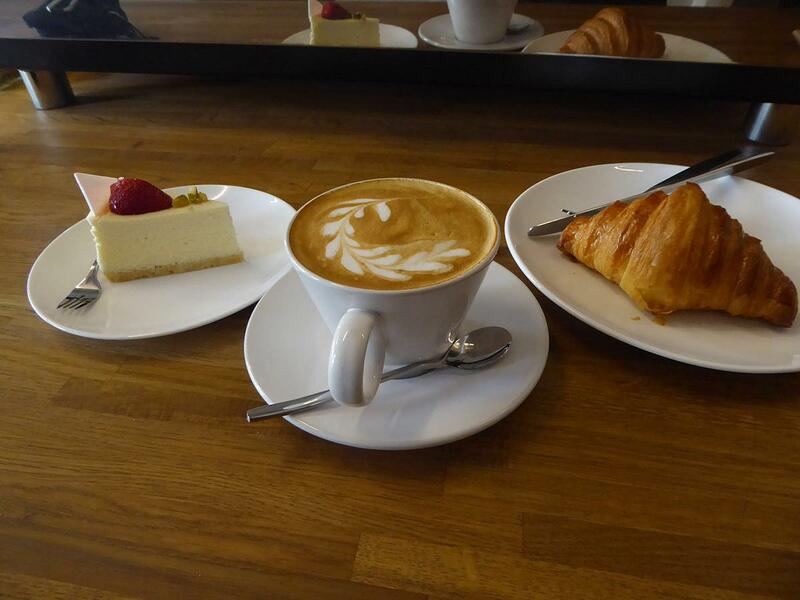 The café serves hot and cold drinks, snacks and bakery. Getting There: Chao Phraya Express Boat to Tha Tien Pier (N8). 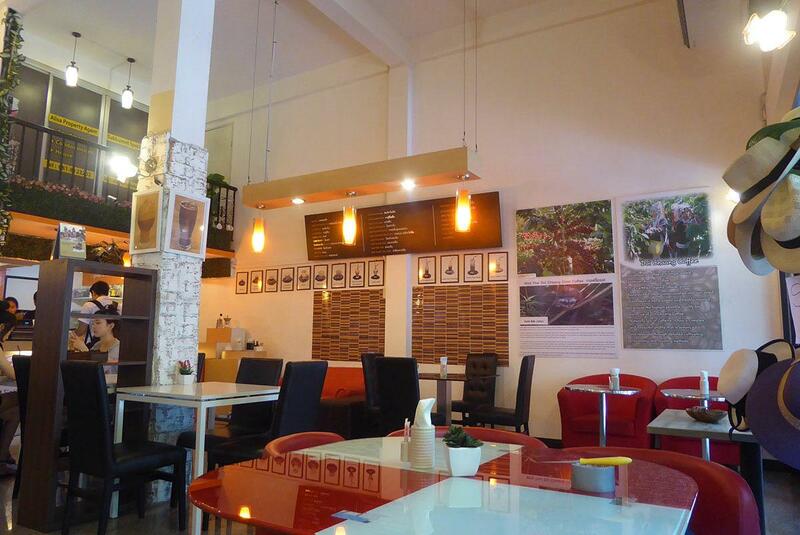 Korrakang is a pleasant 2-story cafe/restaurant on Maha Chai Road. It’s a short walk from Wat Saket and the Golden Mountain and opposite Wat Thepthidaram and Wat Ratchanatdaram temples. 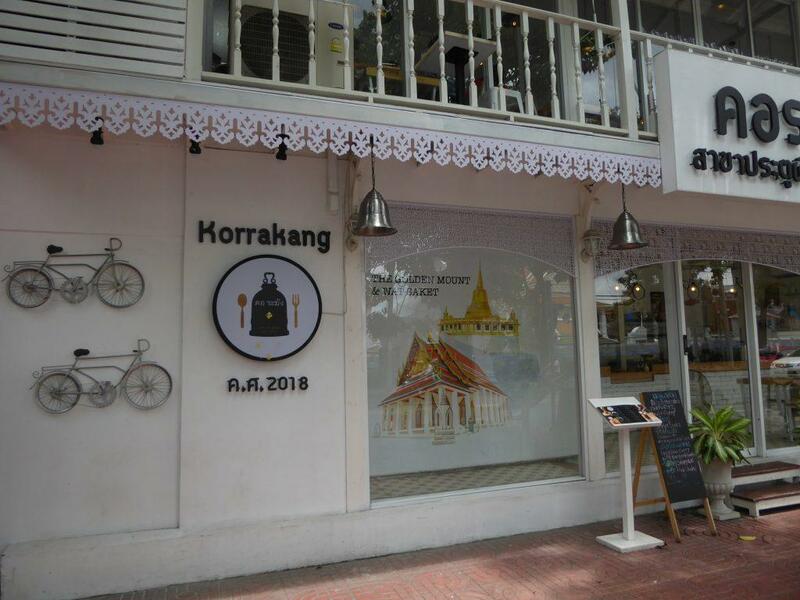 Korrakang serves coffee, tea, shakes and Southern Thai food specializing in Roti. 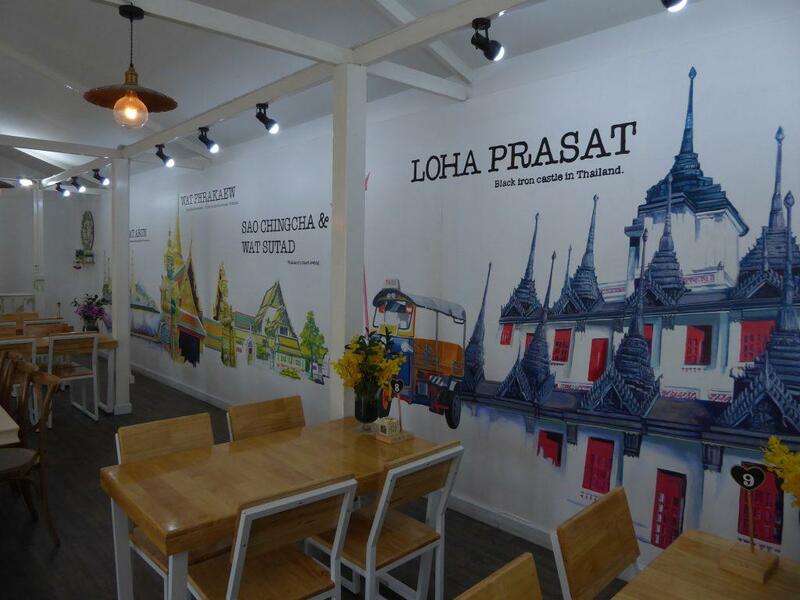 The decor is predominately white with some nice paintings of nearby famous sights adorning the wall. Beverages are 80-115 baht while the food menu is mostly in the 120-180 baht range apart from seafood dishes which cost from 290-950 baht. The Roti menu has 17 choices which cover a variety of fillings and toppings as well as a design your own option. Prices run from 29-169 baht. Korrakang is open until midnight. Location: 237/2 Maha Chai Road, Samren Rat, Bangkok. Getting There: Walk: A 12-minute walk from Khaosan Road. 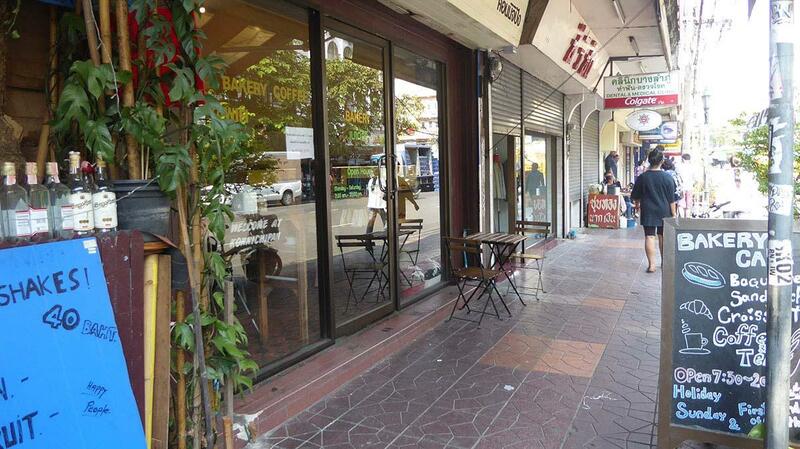 Walk up Ratchadamnoen Klang Road, turn right onto Maha Chai Road and Korrakang is on the left-hand side. 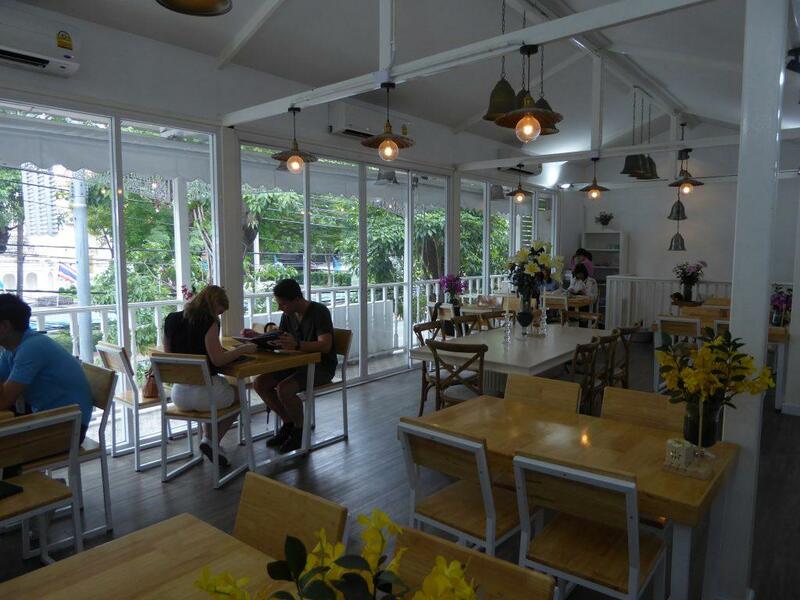 Blue Whale is a cool cafe just around the corner from Wat Pho serving breakfast, lunch, drinks, and coffee. Blue is the color here with blue decor both inside and out. 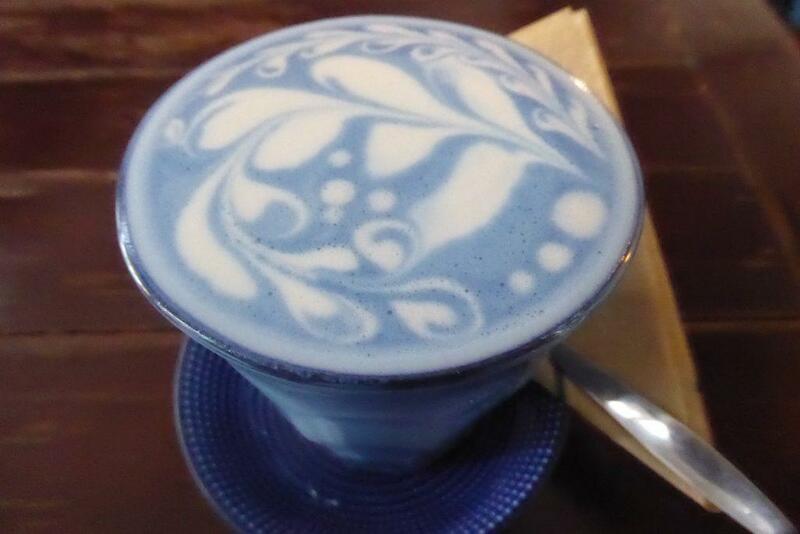 The cafe’s signature drinks are it’s unique milky blue colored butterfly pea latte served hot or iced. It has a pleasant vanilla flavor and a moderately sweet taste but is not for strong coffee lovers. Other signature creations are blue affogato and cold blue coffee. Also on the menu are expresso, cappuccino, frappes, matcha, and teas. There is a food menu serving breakfast dishes such as pancakes and toast with various toppings. A lunch menu features Tom Yam Goong, Salmon Teriyaki and more. There are cakes and brownies. Drinks range from 80 to 180 baht, while food dishes are 160 to 280 baht. 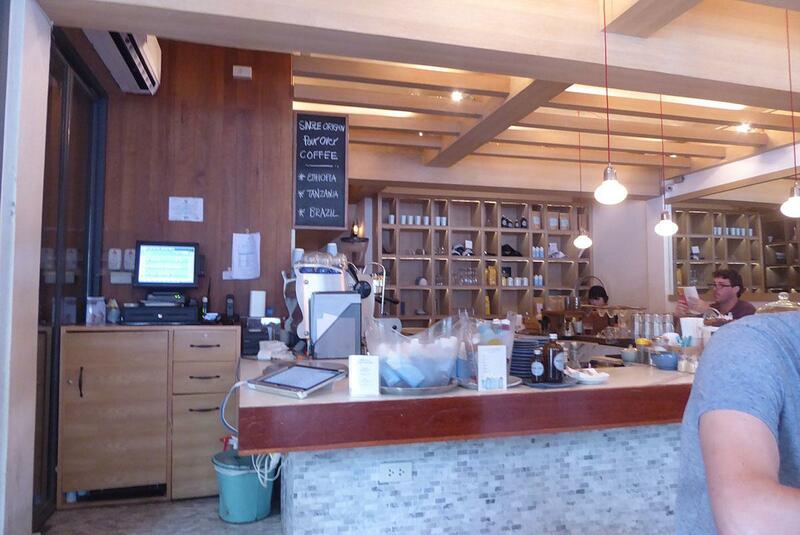 The interior of the cafe is quite small and can get crowded on weekends. There are handy power sockets to charge your phone and the staff and service are friendly and efficient. The customers are a mix of locals and tourists visiting nearby Wat Pho. 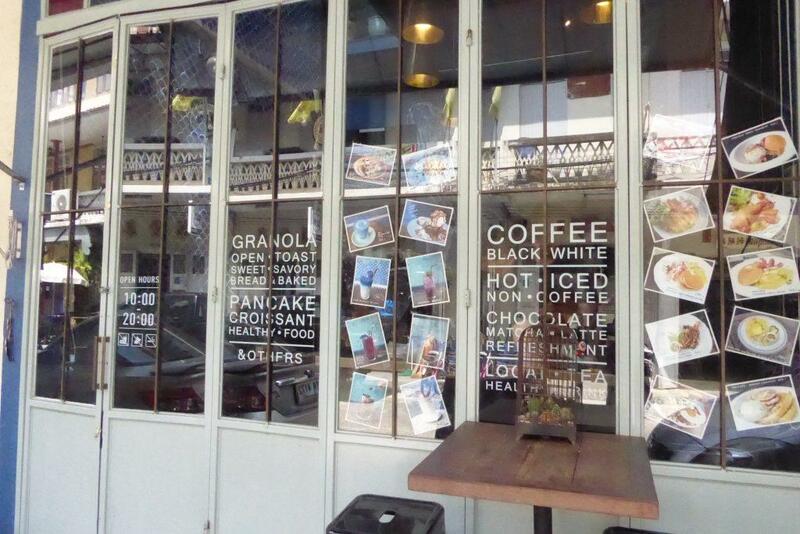 The cafe is just off Maha Rat Road on the Soi next to Baan Tha Tien cafe. Location: 392, 37 Maha Rat Road, Bangkok. Opening Hours: 10.00 -20.00 Friday – Wednesday. Closed on Thursday. Getting There: To walk from Wat Pho main entrance, walk down Thai Wang Alley towards the river and turn left on to Maha Rat Road, turn right into the Soi next to Baan Tha Tien cafe. Blue Whale is on the left. Chao Phraya Express Boat: Tha Tien Pier. Turn right on to Maha Rat Road. Tales Khaosan is a unique train carriage themed coffee bar and hostel a stone’s throw from Khaosan Road. 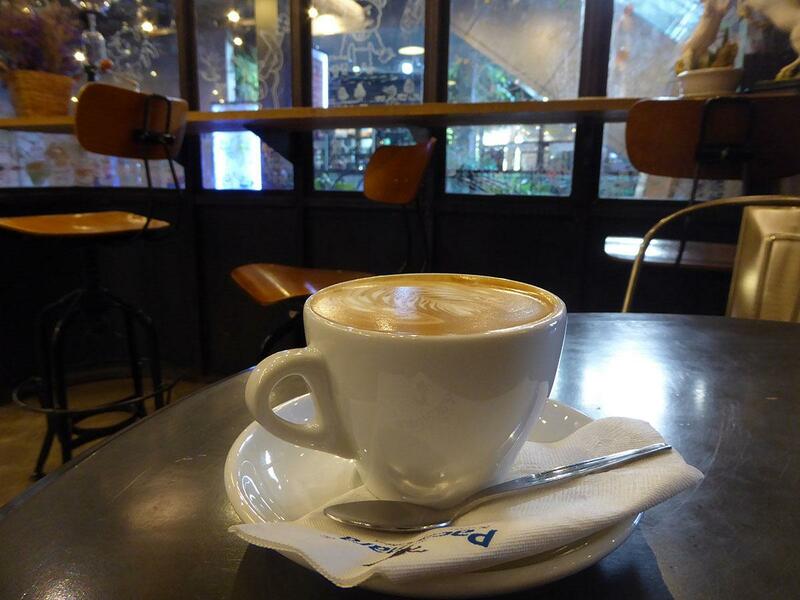 Freshly brewed coffee is available at the ground floor cafe while the hostel rooms are on the upper floors. The shiny decor is complemented by a choice of floor cushion seating, high stools at the counter or tables with bench seating. 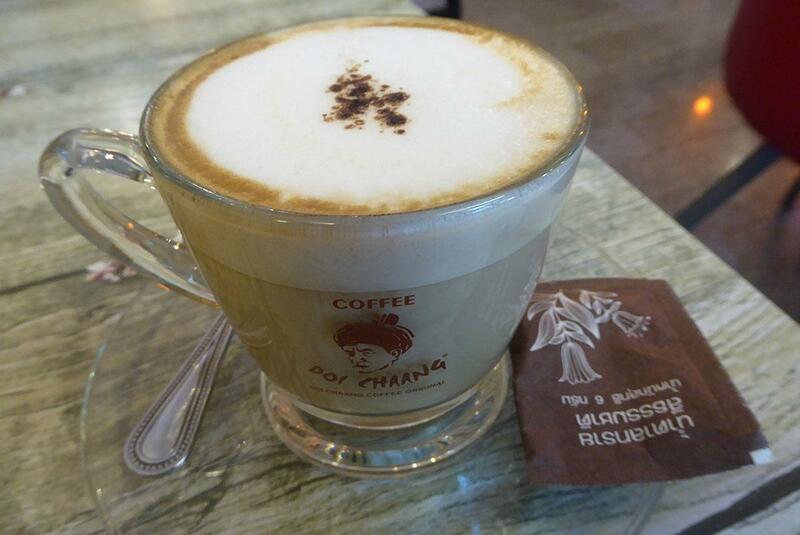 The coffee is good and strong with a choice of northern Thai beans from Chiang Rai or an Asian/South American blend. Cold Brew, Matcha, and Thai Tea Latte are also available. Foodwise, small snacks are available such as toast, croissants, granola, and yogurt. Prices are reasonable from 75 – 180 baht. Beverages are 50 – 110 baht. 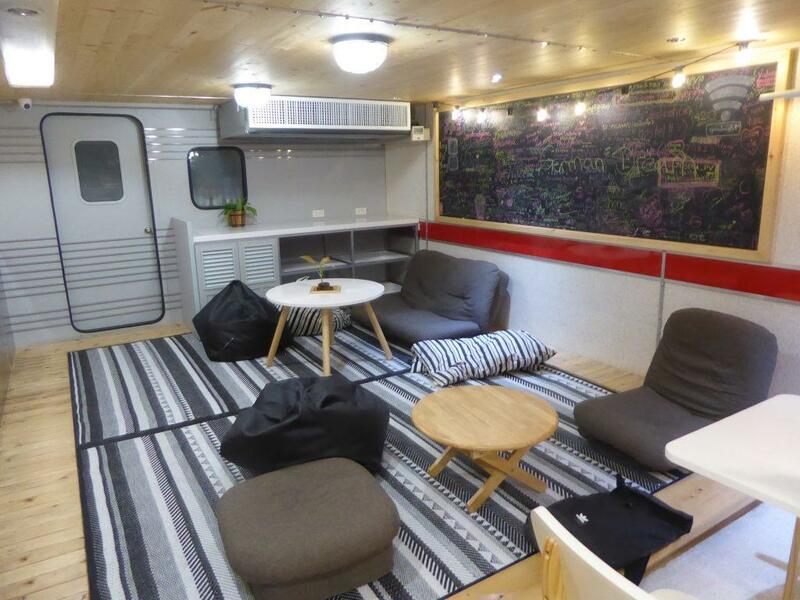 There is free WIFI and a 24-hour co-working space will be opening soon. 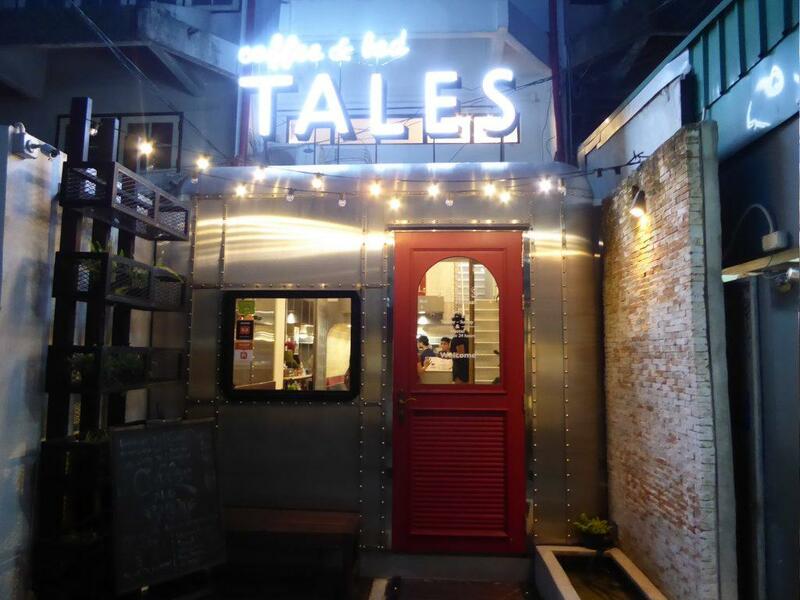 Tales is just off Chakrabongsee Road in an alley opposite Chanasongkram temple. Location: 88 Chakrabongsee Road, Banglampho, Bangkok. Opening Hours: 10.00-18.00 Tuesday – Thursday. 09.00-20.00 Friday – Sunday. 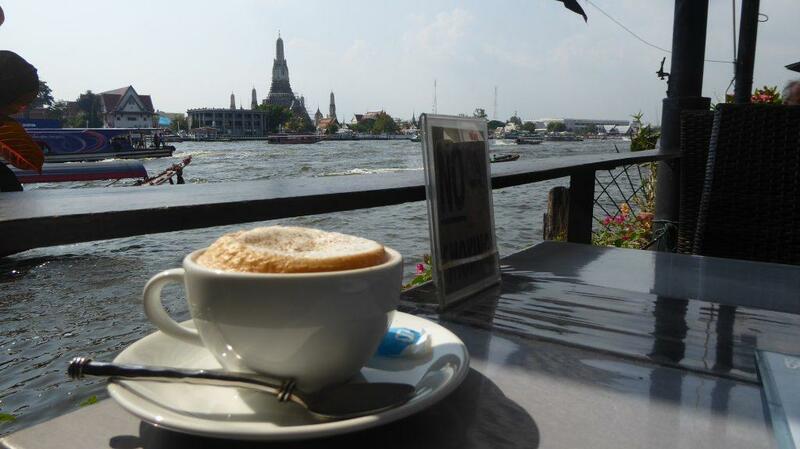 Chao Phraya Express Boat: Phra Athit Pier, turn left & walk up Phra Athit/Phra Sumen road. Turn right at the intersection and Tales is on the left in the alley just past Starbucks. 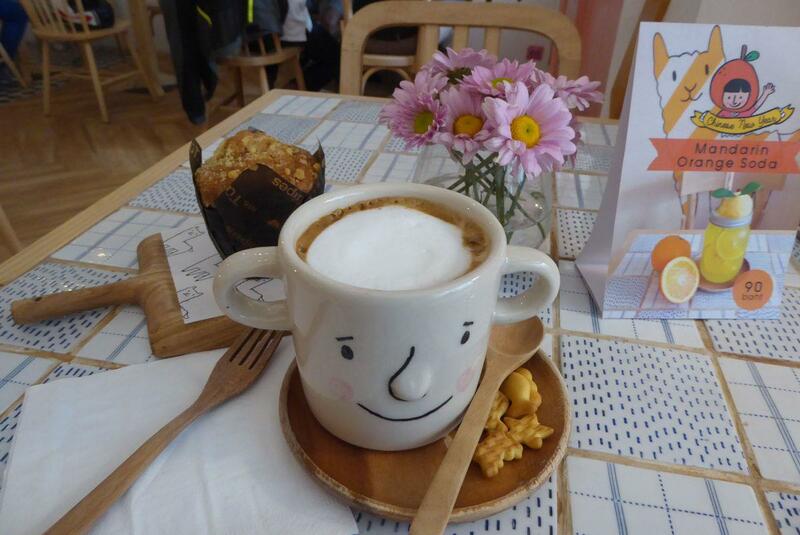 Bangkok has a number of themed cafes including Hello Kitty House, Maidreamin (a Japanese Maid Style Cafe), and Dog and Cat petting cafes. Click the Theme Cafes link above for more details.